When is it the right time to move forward? That depends on who you ask. If you ask Kate Keller, the matriarch of Arthur Miller’s morality play “All My Sons,” moving on is not an option. Even though all indications are that her son Larry has died. Larry has been reported missing three years prior while flying a mission off the coast of China, but that doesn’t stop her from enlisting the help of neighbor Frank to figure out Larry’s horoscope. But if you ask Larry’s brother Chris, it is certainly time to move on. In addition to the realities of the situation, there is also the fact that Chris is sweet on the lovely Ann Deever. Ann was Larry’s girlfriend at the time he went missing, and a person who corresponded with Larry up to two years after his disappearance. In the Douglas Morrison Theatre’s production of Arthur Miller’s classic “All My Sons,” these and other questions must be answered. There is one major problem – why discuss it? Patriarch Joe was exonerated of the charges for his role in the death of 21 pilots for selling faulty airplane parts, and doesn’t need to live in the past. He loves and adores his wife and family, and would like nothing more than to move on permanently from this horrific chapter of his life. DMT’s production is not a spectacular one, but is definitely solid. What director Susan Evans consistently gets right through the production is the tone her steady directing hand sets. In any tragedy, there are moments that are light and the company most certainly found humor in those critical moments. The ensemble cast was nicely assembled, with some very strong anchors throughout. One thing that comes through nicely is the natural chemistry that flows through both John Baldwin’s Joe and Patricia Tyler’s Kate. Both were extremely convincing as a long-time married couple, as both seasoned performers navigated smoothly through the rough terrain of their character’s lives. Specifically, Tyler brought just the right amount of truth to her role. Which comes from her technique of listening to what’s given to her character, with a sharp reaction following. Consider the various moments where she is told to move on from the hope of her son. She responds with a variety of emotions, from anger to steadfast denial, which juxtaposed nicely with Joe’s more pragmatic views. Other cast members filled the roles admirably as well. Jeffrey Hoffman carried the emotional demanding role of Chris with very nice range, finding the highs in his relationship with Ann (a gentle Jessica Chisum) and the lows of grisly discovers with his father. Geoffrey Nolan, playing George Deever, found a nice chemistry as well with Kira Sullivan’s Lydia, revealing lost love in a very organic way. Yet where the show could continue to sharpen is in its emotional demands. I wasn’t always clear how the emotions really affected Baldwin’s character, which could have made the final resolution more honest. His soul must be more tortured in order to form a more convincing belief that his pain must end. And as a whole, there was a smattering of various moments in act two which could have lent itself to bigger truths. The production values technically were sharp. Kim Tolman’s literal and metaphoric set design is quite lovely, really creating a type of Rockwellian feel that contrasts nicely with the irony of their lives. And the leit motif’s of Donald Tieck’s sound design of airplanes whizzing through the air remind us of the difficulties of moving forward for this family. 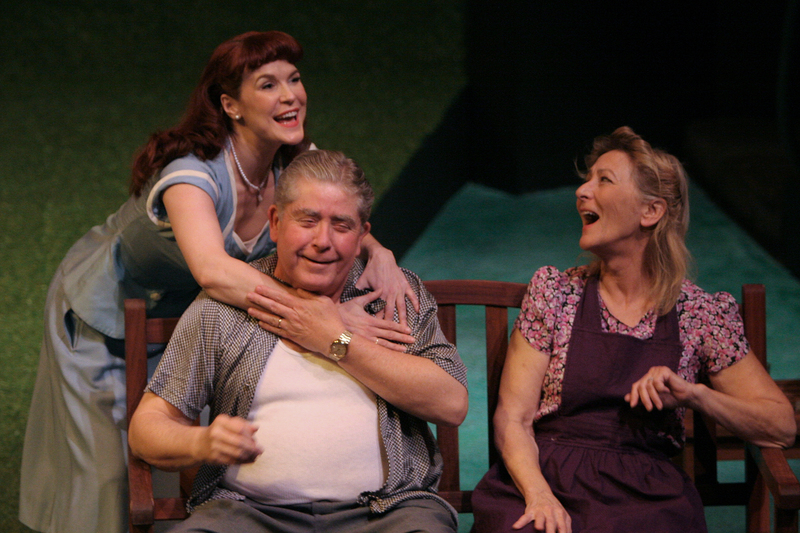 What makes “All My Sons” such a tragedy is that it makes a man like Joe Keller, a good and decent man, act in a way where greed and the love of his family takes over. Men like Joe, or even “Death of a Salesman” protagonist Willy Loman can’t always get out of their own way. Those who make painful decisions do not see the horror and grief they cause right away. And unfortunately for Joe, his acceptance of what he has done comes too late.